Here is the story behind that viral “Sgt. 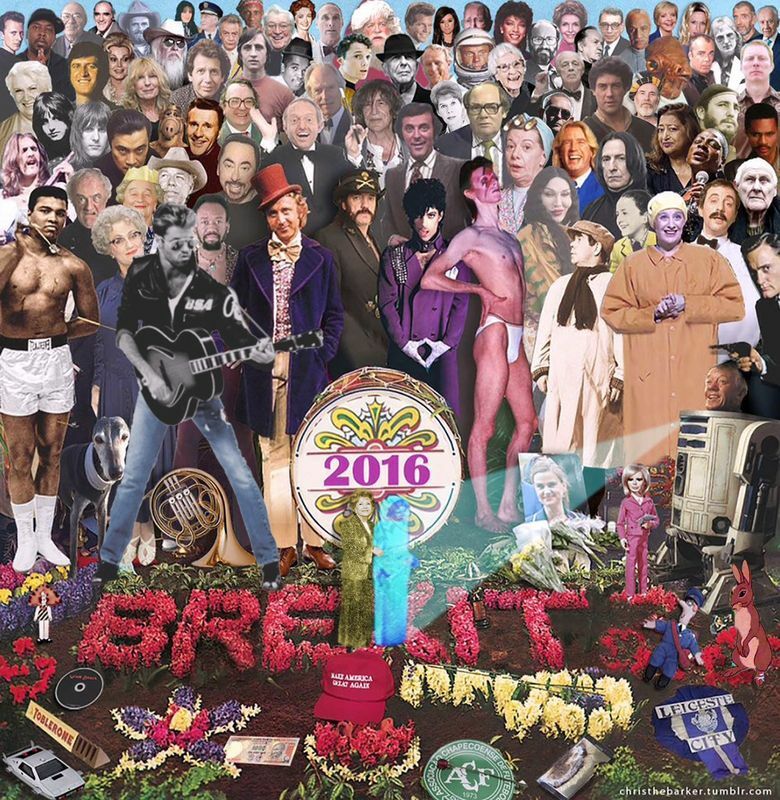 Pepper’s”-inspired collage featuring 82 personalities who died in 2016. Carrie Fisher and her mother, Debbie Reynolds, were the latest addition. You might have run across the viral image that uses the unforgettable “Sgt. Pepper’s” album cover, but replaces the images on it with celebrities who died in 2016. David Bowie. John Glenn. Fidel Castro. Leon Russell. Arnold Palmer. Leonard Cohen. Alan Rickman. And just recently, George Michael and Carrie Fisher. And then Debbie Reynolds, Carrie’s mother, who died Wednesday at 84. There are still a few days left in 2016, the Year of Loss. The Twitter account for London art director Chris Barker, who created the collage, now has that image at 4.2 million impressions. Add to that tens of thousands of reposts on the internet. Barker first posted the image Nov. 9. He says he just wanted to use graphics to sum up the tumultuous year, not only with personalities but such events as Brexit, important to where he lived. He first considered having David Bowie at the center and everything else orbiting around it. “A lot of people speculate that Bowie was actually the glue that was holding the universe together. It’s certainly been a bit different since he tragically passed away,” Barker wrote in an essay. Sure, it was “a bit of a designer cliché.” But a fantastic cliché. He completed the collage in three hours. But since Nov. 9, personality after personality has died. He’s now got 82 people on the collage. “I’ve totally run out of space,” says Barker. Then he woke Thursday morning London time to the news that Debbie Reynolds had died. “Oh, god, that poor woman. This is horrible,” says Barker. He had the collage with R2-D2, the droid in “Star Wars,” beaming Carrie Fisher as Princess Leia. In the revised one, Debbie Reynolds is standing alongside her, smiling and reaching out to her daughter. It packs an emotional punch. “I mean, it’s so mawkish. Now I feel awful doing this. Like a coffin chaser,” he says. Barker soon learned what happens when you go viral. Within two minutes of the original posting, Barker was getting messages about an error. Lemmy Kilmister, who fronted the heavy-metal band Motorhead, died in 2015 (Dec. 28), not in 2016. “A commenter said I should say I was counting his death from when his liver realized a week later,” says Barker. Now, he says, he gets messages about this or that personality not being included. “I ignored the millennials talking about Harambe the gorilla (shot and killed at the Cincinnati Zoo after grabbing and dragging a young boy). That’s their thing and I’m not qualified to talk about it,” says Barker. As for 2017, Barker says he’s not planning on a similar image. Not “unless someone hires me to do it and gives me a massive picture budget,” he says. He hopes maybe it’ll help him get freelance work, says Barker.